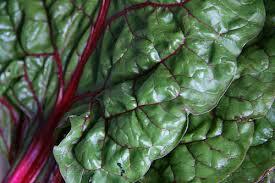 Swiss Chard is an amazing vegetable — it tastes great, and is really good for you! It is a great source of vitamin K, vitamin A, vitamin C, and a variety of other vitamins and minerals. It also has a variety of health benefits, such as blood sugar regulation. For more information on swiss chard, check out: http://www.whfoods.com/genpage.php?tname=foodspice&dbid=16 . This site contains information about the vitamin and mineral content of foods, their health benefits, how to store them, and different (healthy!) ways to cook them! My favourite way to cook swiss chard is by sauteeing it in olive oil, with onion and garlic, and luckily this is a great time of year to get garlic at the farmers’ market. You can eat this alone, as a side, or incorporate it into a dish, like I have here. Cook the pasta according to the directions on the package, and set aside. Heat pan to medium-high, and add olive oil and onion. Sautee until the onions are translucent, then add the garlic and sautee for another minute. Lower the heat to medium and add the swiss chard, and the broth. Keep stirring the swiss chard, and cook for 3-4 minutes. Add the peppers. Cook until the swiss chard has wilted (another 1-2 minutes). Add the swiss chard to the pasta, and mix together. Salt and pepper to taste. Add parmesan cheese to serve. This entry was posted in Garlic, Orange Peppers, Red Peppers, Swiss Chard, Yellow Peppers and tagged garlic, orange pepper, red pepper, swiss chard, yellow pepper. Bookmark the permalink.